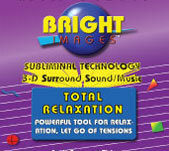 BRIGHT IMAGES™ represents an extraordinary commitment to bring you the most advanced technologies available in subliminal educational for self-improvement with quick results. 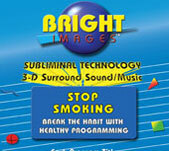 We are often asked by seasoned self improvement leaders, "what makes Bright Images™ Programs so highly effective". The short answer is the combined, SYNERGISTIC EFFECT of several advanced technologies into one advance product for quick results. 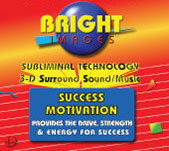 For subliminal to work very well, in a short period of time, many factors are required work well together. (1) Using expert developed, proven effective, physiological selection and order of affirmations to have a profound effect within your physic. 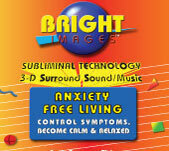 BRIGHT IMAGES™ Self-Help Audio Subliminal Programs were first developed in 1987, utilizing proven, effective and successful technological advancements first pioneered by MIDWEST RESEARCH. From many years of controlled research and studies in the fields of professional business, sports and life sciences using advanced subliminal educational techniques of SCWL® (subconscious-to-conscious-way-of-learning). 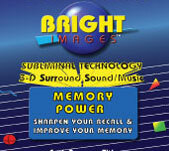 Bright Images™ started with proven, effective technologies with continued developments. (3) Using the highly advance SARA® Recording Technologies during the live recordings of our Environmental Sound Tracks, providing a very enjoyable listening experience of LIVE 3D SOUND. 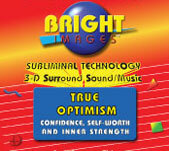 Bright Images™ fantastic musical compositions have been specifically developed and arranged by George Degorski for Bright Images Subliminal Self-Help Programs, exclusively. 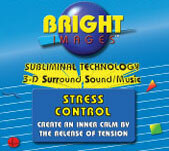 Each composition was developed to provide you with an enjoyable experience when played repeatedly as background music. The more you listen, the more you become inspired and the better they sound. They are exciting, effective and they are original compositions arranged exclusively for each 6 Series, 37 Bright Images Audio Program titles. Each program titles and 4 or 5 compositions, mixed and match for each title. A sampling of each programs title can be listened to by using the Sample Tab, located at the top of each page. 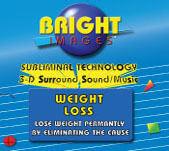 Each of the Bright Images™ Self-Improvement Programs have been developed using independent research from experts in their fields to create positive scripts to have a profound change within your subconscious. Complete statements how you see yourself. Very specific and directed visions of yourself with a new Dynamic Self Images, see yourself as a highly motivated, successful personal. These positive images create a new personality from within. 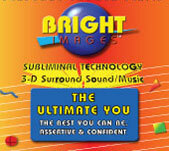 Affirmation like, "I see myself as a successful person" are then recorded into specific file storage areas by your subconscious recording (bio-computer) for future recall. This process is automatic, it is how we operation, we record everything we are exposed too. Advertisers have been embedding us with there products forever. We tend to become a product of our environment, the one that we are exposed too. Today we are given a choice of what we put in our minds. We can now off-set past negitively and self imposed limitations by adding twenty thousands positive visions (per hour). Dynamic visions with a new zest for action and achievement. Energetic new images of ourselves allowing us to now reach your requested goals. "What man seethe and believe in, he can achieve". 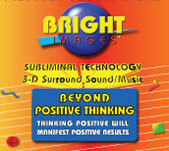 With these highly focus, concentrated positive stored images, your conscious mind can act on differently. We are now able to make decisions based on new positive images to satisfing our new personal self improvement goals, from within. Our “emotionalized nature sound track and music” turns out to be the masking for our 20,000 affirmations embedded within each program. Furthermore, we have coded our affirmations using (SARA®). This “Emotionalizing Process”, causes our affirmations to be far more readily available to your subconscious recording equipment (bio-computer) during our mind’s subliminal storage & recording process. This process is very successful at by-passing the conscious mind and sending data directly to our subconscious mind, using a very complex set engineering tasks, unique only to Bright Images. Every thought has a frequency, every image has a thought and your thoughts can manifest into real achievement.